The ForestER module supports the estimation of carbon emissions from deforestation and forest degradation, including production of a report. 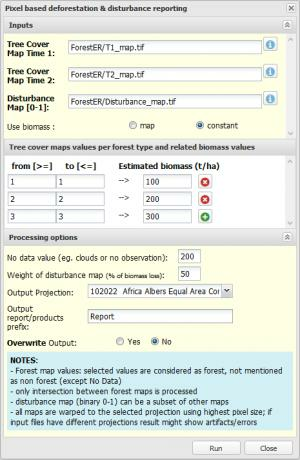 In contrast to the CarbEF module, the ForestER performs a pixel-based calculation of emissions, using as input pixel-based forest maps at time1 and time2, as well as a pixel-based map of forest degradation. ForestER accommodates forest type and related biomass classes. Forest Map at Time 1 & 2: maps of forest cover status in raster format either derived from pixel-based classification or converted from existing vector maps. If no national forest maps are available, is possible to derive them from e.g. the Global Forest Cover or the JRC Roadless map. Google Earth Engine (GEE) Delta-rNBR tool (recommended), showing evergreen tree cover disturbances events within a defined time frame; script and a manual http://sci-hub.tw/10.5281/zenodo.1014728 publication http://www.mdpi.com/2072-4292/10/4/544 . 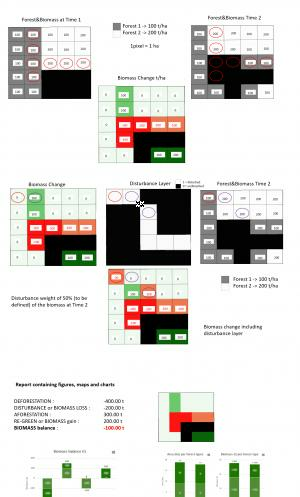 User has to assign a percentage value of biomass loss caused by disturbed pixels; default value is 50%, meaning that for each mapped disturbed pixel half of the assumed biomass at time 2 is counted as loss and therefore emission. In case of deforestation events, disturbance has no effect. as the GEE Delta-rNBR compares the worst canopy cover conditions accumulated over each investigation period, this approach is able to catch even short-lived signals (often degradation events are only visible for a short period) and can deliver wall-to-wall data. Test dataset containing 2 forest maps, disturbance layer and biomass map (as on figure) is available here (10kb). Maps are re-projected to equal area according to user’s choice for accurate area estimation. Analysis is only based on the intersecting area between the 2 forest maps (and biomass if provided) and by using the highest spatial resolution. Disturbance map can partially intersect. Eventual buffer introduced by the re-projection is considered as nodata. In case of no valid observations (cloud, shadows, no imagery) or parts of the maps outside the region of interest (e.g. country border), is recommended to identify them with an unique value different from 0 (to be then set in the interface as well) so as the algorithm is able to mask it out during the area and emission estimation. User defined forest classes are plotted using a green color ramp based on biomass: higer the biomass value, darker is the green tone.